Mini or nano computers. What is it and how they work? Computers are getting smaller every day. Ten years ago all PC were called micro computers. Mainly because they were smaller than a size of a room :). Now is a new era of micro or nano PC desktops. Many of users didn’t even know that there are very small PC’s and they can replace your desktop PC and handle all office duties without any lag. Mini computers are not super powerful and are not able to replace your gaming PC. But they can do all regular stuff – like email reading, word processing and even full HD movie streaming. They are powerful enough to play a web browser based games too. The best part – micro computers are really small. They look more like external hard drive than a desktop PC. Computer repair Ltd could find few of them. They were almost the same size (check pictures) and powerful enough to do all the tasks we mentioned before. So why I suppose to buy this nano PC instead of normal one? First thing that attracted us – price! You can buy this small computer for £95 only! And the size! It can fit everywhere. You can even screw this PC to the back of your monitor or hang it on the wall behind your TV. As always there are few buts … Be careful, these computers are barebones. This means you don’t have everything included in the package. You will need to buy additional parts for it to work and some mechanical work will be needed too. If you did not hold a screwdriver in your life, it is better to hire professional computer technician to do this for you. So what the price will be for my micro nano PC you ask? Let’s count. You will need additional RAM and Hard drive for it. We recommend 4GB of memory. But be very careful – this device needs new type DDR3L memory. This means it needs 1.35v (low voltage) memory. And it is not working with standard DDR3 ram. Trust us – we tried already :). And the hard drive. We recommend buying 64GB or 128GB SSD (solid state drive). With this your nano PC will become much faster than most of medium level full size desktops! In total this adds up to £190 (£100 barebone + £30 RAM + £60 SSD) or a little bit more for bigger or faster hard drive. Not bad for a mini PC with all features of full size PC. What these small machines have? Almost all of them have 2 or 3 USB ports. One of them is USB 3 other two just USB 2. 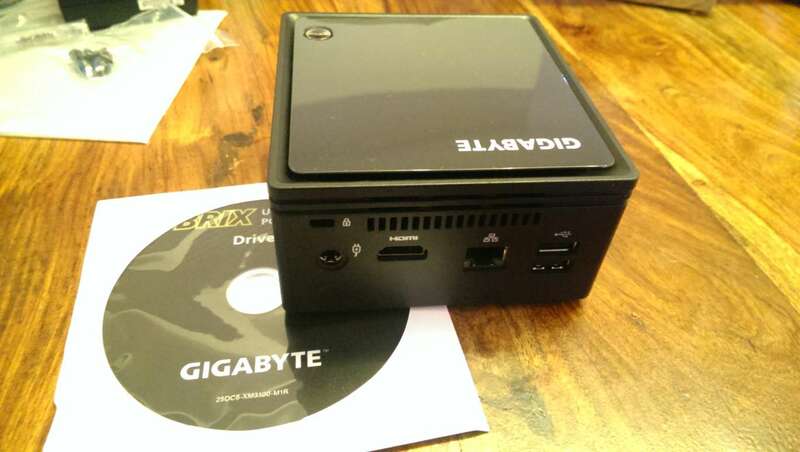 Gigabyte nano PC we tested had RGB and HDMI ports. Intel – just HDMI port. All of them have integrated WIFI n adapter, gigabyte LAN and a microphone / headphones port. It’s just what you need from desktop PC. Some of the more expensive mini computers have card reader slot installed. What about a DVD writer you ask. I don’t think you are using one very often now, do you? But you can buy and connect an external USB DVD writer for twenty pounds. What system mini computers can handle? We tested it with brand new Windows 10 technical preview. And it handles it great! Not a problem at all with installation or drivers. Drivers you can find on manufacturer website are for windows 8.1, but all of them works fine with Windows 10 too. These nano PC’s did all tasks without any hassle. Network performance is great. Full HD video runs smoothly. HDMI port for video and sound works well too. Just plug and play. We tested everything in full HD resolution 1920×1080 pixels. Should you buy one? Will it replace my old and enormous desktop? The answer is yes and yes. It will save you a lot of space without losing computing speed and any features. This PC is very good for office use were space on the table is limited. It is also can be useful at home. You can use this micro PC as alternative to smart TV. With wireless keyboard (with touch pad on it) it will be like two in one – TV with computer capabilities. You will be able to steam online movies, check news and socialize on one screen. Where I can buy one? It was quite difficult to find this nano computer in the shops. You cannot buy them in regular shops like Curry’s or PC World (they are the same company now). You can try to look on eBay, but we have found a few of them in Maplin stores. But play safe. Computer repair Ltd advices you to consult the geek you know or another computer specialist to put it together. And do not forget that it did not include Operating System. You need to install one by yourself. Intel NUC is our favourite. It is very quiet and very solidly built. Our tested model had 3 USB ports. One USB3 in the front and two USB2 on the back. There is an infrared port on the front for the remote control. This model has 2 RAM slots to add more memory. 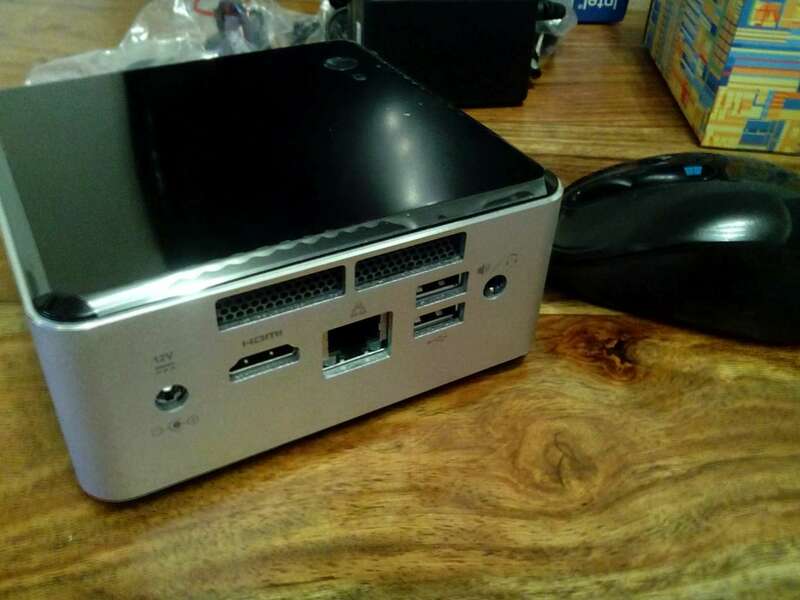 Intel NUC has aluminium casing what makes it extremely light and strong. Both models have VESA mounting brackets. You can screw hand them on the wall, under the table or at the back of your PC monitor.